As the name implies, Centennial Trial State Park is created around the Centennial Trail that runs alongside Spokane River. This wide path is paved and stretches from the border of Idaho to northwest Spokane, ending at Nine Mile Falls in Washington. Most of the trail follows the meandering banks of the Spokane River, but includes a slice of downtown Spokane, as well as eastern and western rural branches. Frequented by hikers and bikers, as well as by roller-bladders, it is enjoyed for its natural beauty. No motorized recreational activities are permitted. While some consider it the ideal place for a stroll, others consider it the best place for an aerobic power walk or a challenging bike ride. Visitors can enter or exit the main trail from many conveniently located trailheads. To ensure safety, the park is patrolled by park rangers as well as Sheriff’s deputies and city police. The Centennial Trail can best be described by breaking it into three main sections: The Riverside State Park region, the Urban region, and the Valley region. The western section of The Centennial Trail has spectacular scenery, offering a panoramic view of the Bowl and Pitcher region and the winding Spokane River nestled in a forest of towering fir and pine trees. Although other parts of The Centennial Trail are rather flat, this region has sharp climbs and steep descents. Although this forested area has climbs of short duration, they still require a certain level of agility and endurance. The urban aspect of The Centennial Trail starts around milepost 17 at the parking lot and restroom area on the east side of Upriver Drive, which is near the Frederick Avenue intersection. At milepost 18, near Greene Street, it returns to a separate path that runs alongside Spokane River. The Valley segment is almost a completely Class 1 trail (a safe and separate trail). The landscape is flat, following the gentle riverbanks of Spokane River. The Centennial Trail begins on the state line between Washington and Idaho and referred to as the “zero mile marker.” In actuality it is two contiguous trails, the Spokane Centennial Trail and the North Idaho Centennial Trail, forming a total distance of about sixty miles. 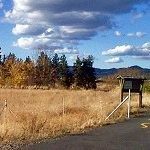 Although the lead management agency is the Washington State Parks, The Centennial Trail is also jointly managed by Spokane County, Liberty Lake, Spokane Valley, the city of Spokane, and Riverside State Park. The best way to explore The Centennial Trail is to get one of five trail maps, depending on the region you’re interested in. • Havana Street to T. J. Meenach Bridge in downtown Spokane. • T. J. Meenach Bridge to Nine Mile Falls in Riverside State Park. The trail was named after the Washington State Centennial and most of it was created from 1989 to 1991. In total, the Spokane Centennial Trail runs thirty seven miles and it is completely paved from one end to the other. Thirty miles of it are classified as Class 1 and it is continuing to be built. It is estimated that well over 2 million people have enjoyed The Centennial Trail connecting the communities of Spokane and Coeur d’Alene, using it for walking, running, skating, or biking. Its popularity is due to its tranquility, a place to enjoy peace in the quiet of nature. Visitors enjoy listening to the gentle flow of the river and the abundance of wildlife. Those desiring more information should contact Friends of the Centennial Trail. General inquiries should be directed to telephone number 509-624-7188. Written inquires and comments should be mailed to PO Box 351 Spokane WA 99210-0351, and email should be directed to friends@spokanecentennialtrail.org. The physical office of the Friends of the Centennial is located at 28 West Indiana, Suite F, Spokane. The office is open on Mondays from 8 am to 12 noon and from Tuesdays to Thursdays from 8 am to 4 pm. It is closed on Fridays and weekends.